Necklace giveaway - 200 followers! [CLOSED] | Memorable Days : Beauty Blog - Korean Beauty, European, American Product Reviews. Hurrayyy ^o^ 200+ followers !!! Thank you everybody for following me ='D To celebrate it, I'm having another giveaway. Continue with reading to see what kind of prices you can win ^____^! UPDATE: This giveaway is closed! This giveaway is sponsored by Goudpensioen.nl. It's a Dutch shop which sells gold-, silver- and platinum bars and coins in The Netherlands. You can order online, but you can also visit their shop in Amsterdam, The Netherlands. It ships worldwide as well, so if you are interested~ visit their website at: http://www.goudpensioen.nl/. 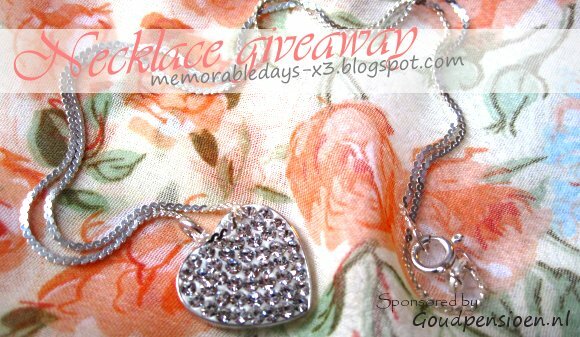 The owner of Goudpensioen.nl has sponsored me two beautiful Silver necklaces for this giveaway, both worth more than €20.-. There are two prices, which means that there will be two winners =D. Necklace #1: A Silver Necklace- heart shape with zirconia crystals in it. The heart symbol is 1,8 cm. Princess length necklace; 20,5 cm. This necklace is worth €30.-. Necklace #2: A Silver Necklace - Triangle shape with a zirconia crystal in the middle. The triangle symbol is 2,5 cm. Princess length necklace; around 19,5 cm. This necklace is worth €21,50. Blogs which are especially made for giveaways are NOT allowed to enter- I will check. 1. You must be a follower of my blog through Google Friend Connect (GFC) publicly. 3. (+1) ”Like” Memorable days facebook page. You must leave your fb username in your comment. 4. (+1) Follow ElisaLee_ through twitter. You must leave your twitter username in your comment. 5. (+2) Write about this giveaway on your own blog and post the picture of my accessory giveaway as well. This giveaway is closed! The two winners will be picked through random.org. Yay. Another giveaway <3 ! Great giveaway, Elisa! Enter me too please! en heb getwitterd over je geweldige actie! Facebook username: Didn't do that. Link to blogpost: Haven't done that. nice giveaway sweetheart!!! have fun with the contest!